Jazz lost yet another innovative original, singer Anita O’Day, who passed away at the age of 87 Thursday, November 23rd. Considering the life she led, well detailed in her autobiography of some years back, “High Times, Hard Times;” it is simply amazing that she made it past 50 years of age. And she was singing, after a fashion, just about up until the end. O’Day was at the forefront of an entire school of jazz vocalists from Chris Connor and June Christy on up and on down, and it’s a “school” that continues today in various guises. For instance, O’Day’s amazingly wide sphere of influence included plenty of jazz-oriented popsters, including the likes of Joanie Sommers. Britain’s Stacey Kent, who sounds almost exactly like Sommers (though Kent told me she never really listened to Joanie), is therefore, in a way, an O’Day student, albeit a couple of times removed. Plenty of male singers got he message as well. It’s hard to believe that Mel Torme’, for instance, didn’t listen closely to Anita. She, along with Roy Eldridge, really helped put the Gene Krupa band on the popular and critical map upon their arrival in 1941. Gene’s crew, until then, was a good, more-than competent and always musically swinging crew, though it never really came across on records. Though the band had some good singers, soloists and arrangers, there was nothing utterly distinctive about it until Anita and Roy arrived. It wasn’t long after their arrival that Krupa had two, real “stars” on his hands, and a number of hit records, to boot. Anita always had great, great words about her days with the band, and Gene’s drumming in particular, and this was from someone whose quotient of kind words through the years were measured carefully. And no, for the tabloid-oriented amongst us, O’Day verified a number of times that she never had an affair with Krupa. So there! Anita O’Day was among the very, very few in jazz history to successfully modernize as time went on. Her groundbreaking work for Norman Granz Verve record label in the 1950s was more than an extension of cool. Anita O’Day was cool by being hot, if that is possible. She always swung and swung hard. Her scatting was refreshing, inventive, surprising and often rhythmically impossible. She could not, quite simply, get lost, and some of those 1950s charts–Gary McFarland’s, for one–were darned difficult. O’Day even drove Oscar Peterson, a speed wizard if there ever was one back then, to extremes. With the arrival of The Beatles, the entire entertainment business changed and it would never be the same. Julie LaRosa, a fine and underrated singer, once told me, “Before the Beatles, we were thrilled if we could fill a 400-seat club. After their arrival, if you couldn’t fill a 20,000-seat stadium, you couldn’t get work. It was no different for Anita O’Day, though it was likely worse, given the hard times jazz experienced in the late 1960s and early 1970s. In those years, and the sordid details have been repeated often enough elsewhere, she survived drug overdoses, arrests, periods of “almost-homelessness” and worse. Yet musically, when she had the chance, most often for her own Emily record label, Anita continued to evolve, at times foreshadowing what Betty Carter would much later take, to these ears, excess. As “far out” as she may have gone harmonically and rhythmically, Anita O’Day never forgot the lyric. Others did. In those years, like many artists in similar situations, she took work where she could. The scenarios were not often pleasant. Her general frustration with the scene and with the bread, to say nothing of her difficulties at the time with alcohol made for some strange situations on the bandstand. At a small club in Philadelphia, for instance, Anita berated the local trio backing her–on the stage–because they didn’t know “Let Me Off Uptown,” even though there was no chart for it in her book. She did some nice work in the 1980s, buoyed by the response to her autobiography (Madonna at one time held the film rights to it), interviews on “60 Minutes and other national television shows, work at festivals, etc. At long last, this miraculous survivor was deservedly deemed a legend. If all had been right with the world, she would have bowed out gracefully at the end of the 1980s, appearing at ceremonial occasions to be justifiably honored as amongst the universe’s most influential artists. Although her chops were just about shot, she kept on singing. Too, too often, the results were variable. Who knows why she kept on. Bread? Glory? The fact that singing was all she knew? Who knows? Ali, Sinatra, Joe Louis comprise just a very few who, in the opinion of the public, stayed too long at the fair. Or did they? The public kept on coming and kept applauding. Isn’t that what was and is important? Cut to the latter 1990s and the year 2000 until now. Though I don’t know all the details, some time during those years, a relative youngster by the name of Robbie Cavolina attached himself to Anita O’Day, billed himself as her “manager,” and began booking her all over the world. The problem was, that Anita O’Day could no longer sing in any way, shape or form, and if my time with her several years ago at the Denver Jazz on Film Festival was any indication, she had little idea where she was. The whole idea of it was, simply, pitiful, and smacked of the grossest exploitation possible. Not too long ago, Cavolina had the unmitigated nerve to trot O’Day into a recording studio–or living room, as it sounded on the CD–to record something called “Indefatigable,” one of the saddest and most embarrassing documents ever recorded by anyone. It is an insult of the lowest kind to the legacy of Anita O’Day, and could have only been done for one reason: bread. If Anita O’Day, the consummate artist, had any idea what was happening, she would have never allowed it. It is a sin that Robbie Cavolina did. A year or two ago, word came that a documentary on O’Day’s life was in preparation, and such a document is long, long overdue. The film is said to me almost completed, and tt’s a shame that Anita did not live to see it. I did, however, get a glance at the preliminary credits for the picture, and it lists none other than Mr. Robbie Cavolina as “director,” “producer” and “writer.” I hope he finally gets some money out of the whole thing which, to me, is why he went into this game to begin with. Anita O’Day, at the very end, deserved better. The New Yorker was once among the city’s hotel showplaces. Every big band played there. It’s now own and run by Ramada and caters mostly to foreign tourists, transients and even has a floor or two set aside for student housing. For those who actually read the dictionary, it’s listed in Websters under “F” for fleabag. I could swear I was bitten by two or three of them during the night. I got the sense that those fleas might have been the same ones that were there when Tex Beneke worked the joint. The experts will tell you that making a film–or in our case, a documentary or “performance-oriented retrospective”–is about as exciting as watching paint dry. It’s actually a bit more exciting than that, especially when one has an editor as talented as Phil Fallo (“Great Day in Harlem,” among many others) at the helm. Phil can make anything look good. 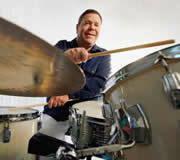 Plus, we had the participation of one of the great mallet artists in history, Mike Mainieri, and a gentleman and scholar who is also the world’s greatest drummer by the name of Steve Smith. These fine people not only narrated our project, but had considerable input into the script. In line with that “considerable input” is the fact that Mr. Fallo and I needed to somehow translate everyone’s additions, corrections and opinions… to what actually appears on the screen. That’s not always easy. As an example, take a section about how Hamp just happened to play jazz vibes on an October, 1930, record session where the Les Hite band backed Louis Armstrong on “Memories of You.” No film exists of this, the story is long and involved, and everyone seems to have a different take on exactly what happened almost 75 years ago. Words are great, to be sure, but this isn’t a book. What do you put on the screen? Ken Burns? Where are you when we need you? I’ll take Ralph Burns at this juncture! Without giving away trade secrets, let’s just say that I found some vintage film of Pops and Gates together, though not from 1930, and a number of still pictures of them both. Phil Fallo worked his magic with this material, and you’d swear it was, indeed, Louis and Lionel in 1930. Ah…the magic of film. Fortunately, Lionel Hampton was among the most filmed and recorded of the jazz giants. That he was eminently photographable and always the showman certainly helped. In “Lionel Hampton: Jazz Legend,” we present film of Hamp in each decade from the 1930s (with the first clip emanating from 1936) to one of his final extended performances with “The Golden Men of Jazz” in 1993. 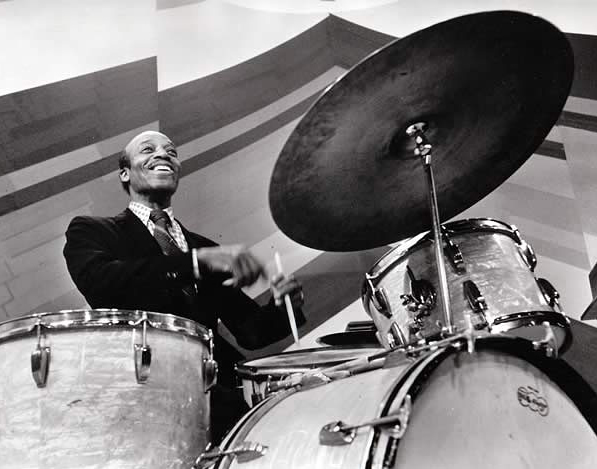 Needless to say, in addition to playing vibes, Hamp plays drums, piano, jumps up on the tom-tom, and mixes it up with the likes of Benny Goodman, Teddy Wilson, Gene Krupa, Milt Buckner, Al Grey, Betty Carter, Billy Mackel, Woody Herman and many, many more. Lionel Hampton was an artist who, along the way, played with everyone from Armstrong and Tatum and Gene and Buddy, to Mingus and Chick Corea. And, as we say in the narration, “he swung them all.” Watch this space for release date. Book update: “Gene Krupa: The Pictorial Life of a Jazz Legend” (Warner Bros. Publications) will go on press shortly after some last minute proofing and design tweaking. It’s quite a package at 170-plus pages of photos and commentary, measures the size of a coffee-table book, and will come with a CD of unreleased Krupa gems. JazzLegends. com friends take note: I insisted that this be priced in the $16.95 range. When it’s released–and you’ll be among the first to know–be sure to buy early and often! Keep swingin and all my best for the New Year and beyond.